Worst company ever!!! Installers came late everyday, took long lunch breaks (2+hours). Job was supposed to take 3 days, ended up being 6. They did not replace flooring under my dishwasher, so it doesn't fit correctly. I have being trying to get empire back out for over a month to correct this and no results, just a run around. Review #891546 is a subjective opinion of zredwine1. We regret that your installation was not completed as planned and assure you that we want to learn more. 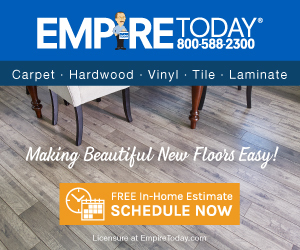 Please contact us at customersuppport@empiretoday.com so we can further assist.